Free Water Testing - A $79 Value! We offer a free water test without obligation so that you can know for yourself the particular contaminants and level of hardness of your water. If you read the annual water quality report from your water agency you will notice that they use a lot of terms like “acceptable” or “within targets”. These terms are just another way of saying your water is “good enough”. Yet if you look into the reports closely you will notice that “good enough” leaves countless contaminants in your water, at levels many times far above California EPA goals, and it includes other chemicals the water agency adds in order to safeguard the water at it travels through public pipes to your home. Getting your water tested eliminates any mystery as to what is in your water, including the chemicals and contaminants it picks up as it is piped to your home. 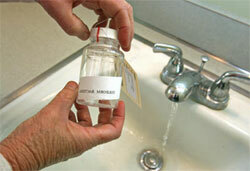 Your water agency cannot know the exact quality of your water or if it even meets their standard of “good enough”. This leads to the real question which is, why leave any contaminants or chemicals in your water at all once it reaches your home? Especially when using a water filtration and water treatment system is accessible and affordable. There is no question that clean pure soft water is better for your health and home over water that contains what others consider as “acceptable” levels of chemicals, dissolved solids, and hardness. With a simple and free water test you can be fully informed about the water you drink and use each day. Using this information you can research the negative effects of different contaminants and chemicals and then decide if it is in your best interest to use a water filtration system and water softener. Below are some common questions about our free water testing program. How long does it take to test my water? The tests take about 45 minutes to an hour depending on questions. What are some of things you do when testing the water? What we typically do is a plumbing audit and 6 to 10 tests for you there at your sink; the testing is valued at $79 and is free with no obligation to you. We test for hardness and demonstrate how the system functions. We do ask is for all decision makers to be present to offer their comments throughout the testing and get all your questions answered. Do you confirm the appointment before coming out? We will contact you to confirm by phone or email. What are you testing for? We test for hardness, Iron, Chlorine, Total dissolved solids, we do a visual precipitation test, etc... It really depends on what we need to test for, if you were on a well or pond water I carry a troubled water test kit and can perform a whole other battery of tests... I assure you its very informative and entertaining, the nice thing is they bring a portable lab to you, so you don’t have to wait for the results. What if I already have a water Softener? That’s okay; we will test your current equipment to see if it is working properly and see if there is anything it isn’t removing, either way it’s good to know what is going on with your water. Our coverage area includes: Contra Costa, Alameda, Solano, Sacramento, San Joaquin, Fresno and Stanislaus Counties.